We hope you find this guide helpful in explaining how to use our web shop to add products and place an order with us online. The shopping basket is shown at the top of the web page and includes the number and subtotal of the items you have currently added to your basket. If you wish to see a list of the products you have already added to the basket, remove and item or change the quantity then click on 'Basket'. Please click on 'Checkout' when you are finished adding items to your basket. The Checkout link is at the top right hand side of the website. We accept PayPal payments. This means you can pay using your PayPal account but also we are able to accept Debit / Credit card payments which are processed via PayPal. When you see the PayPal page just select the card payment rather than logging in to pay with your PayPal account. We do not store any card or address details on our website. All details are processed by PayPal or via our shopping cart provider for added security. Any Questions or concerned about placing your order? 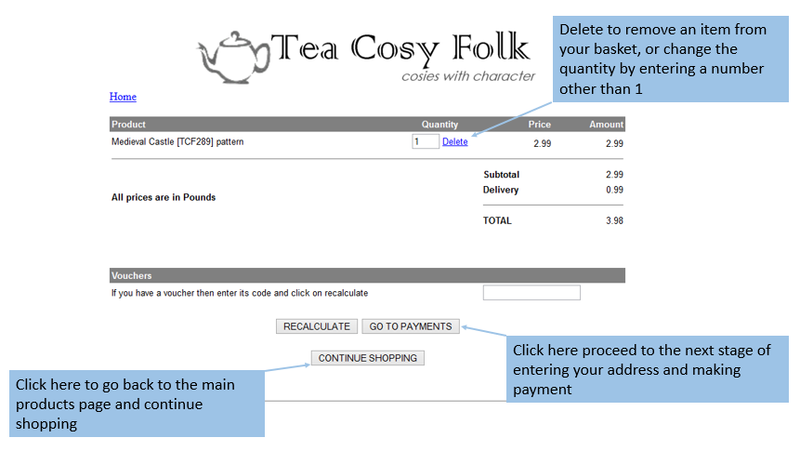 You can email us - susan @ teacosyfolk.co.uk if you want to see that we are real.